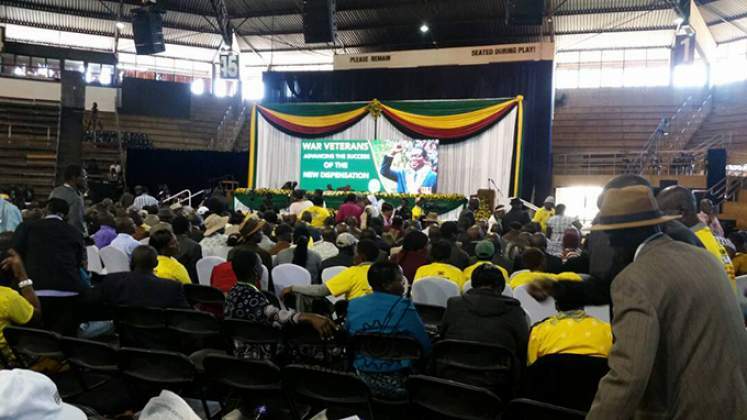 President Mnangagwa is today meeting war veterans, war collaborators and ex-detainees in Harare to discuss welfare issues and ways of strengthening Zanu-PF ahead of harmonised elections this year. Zimbabwe National Liberation War Veterans Association (ZNLWVA) secretary-general Victor Matemadanda confirmed the meeting at the City Sports Centre in Harare. The City Sports Centre is lively today as Zimbabwe's liberation war heroes and heroines have an interface with President Mnangagwa. War veterans' representatives from the country's ten provinces are ready to meet their patron. The interface is running under the theme: "War Veterans – Advancing the Success of the New Dispensation." 1604: Dr Mpofu has finished his vote of thanks and that ends our updates. Thank you for joining us. 1448: Secretary for Administration Dr Obert Mpofu is now the giving vote of thanks. Dr Mpofu thanks everyone who has come and says through this first interface and thanks President Mnangagwa for steering the party in a positive direction. 1544: "Let's go out in our numbers and claim a thunderous victory for our party. Let us not forget to bring everyone to fight for our country. During campaigns, I urge you to commit to peace and love. Our elections will be observed by the international community and I urge you to show them we are a mature democracy. Aluta Continua! God bless you and God bless Zimbabwe," says President Mnangagwa as he ends his address. 1537: "Minister of Foreign Affairs And International Trade SB Moyo is always on the plane marketing Zimbabwe. We need to stop tendencies that stifle business growth and promote corruption. We will remain alive to the need to protect our sovereignty, that is the reason why we took up arms. In a few weeks time, we will be holding general elections. Ours is to toe the party line." 1535: "Strong measures have been put in place to improve viability and competitiveness of the business sector that is why we want to be a middle-income country by 2030. Under mantra ‘Zimbabwe is open for business' we are robustly engaging and re-engaging the outside world." 1536: "We must not fail to uphold the hopes and aspirations of our people and zeal to develop the future of our future generations. Our young ones are a generation hardened by the impact of economic hardships of the past 18 years. Government has already made a decision to increase allowances and pensions of all veterans to cushion you to your daily needs. I take note of empowerment projects you raised. I commend war vets who have continued to do well in some sectors through hard work. You all have equal opportunities to success. My Government will support you in all your endeavours,"
1528: "Work tirelessly to ensure that the Constitution is enforced. We cannot change the past, but we can shape the present and the future. We must dialogue together. We must look forward with great optimism,"
1526: "Going forward, lets inculcate vigilance to defend our nation. Fundamental call of our nation is the Constitution. Let us resolve to defend the country for the benefit of its people. We must pass on patriotism to our children so that they carry on the revolution. Days of state capture by G40 cabal should not visit our nation anymore." 1528: "I recognise this is a meeting between brothers and sisters who had a conviction to go to foreign lands for the liberation of our country. It's not a meeting of patron and war vets. I am a fellow Cde and freedom fighter with no superior standing. Only that I have been chosen to lead the people. The task before us is to rebuild our economy without deviating from party's founding principles. This must involve all Zimbabweans. In doing so, we must commit to rule of law and constitutionalism. Where there is rule of law, the country will not fall into chaos." 1521: "We are planning to install pivot irrigation schemes in farms around the country as part of our initiative to look at irrigation and mechanisation. I agree with Matabeleland North that said the voice of war veterans is the voice of the revolution. About vetting of war vets, that will be done further and thoroughly by the Ministry. We should report any forms of imposition of candidates whenever it has been seen and noticed,"
1518: "On the monthly pension of $206 for war vets, that will be looked at, you heard what VP Chiwenga said. The current leadership is made up of war veterans, so we cannot ignore your concerns." President Mnangagwa says of the Command Agriculture schemes planned by Government, many will be rolled out in Masvingo because there are some useful water bodies. President Mnangagwa warns land officers over taking bribes. 1511: "Next I will also meet with youths and students. After that I will embark on a national tour meeting the water (people) and we are the fish. Some chairmen left other issues because they had been said by others. You raised issue of land barons. We have an inquiry looking into the issue of land barons. Soon I will publish the names of land barons. There are people who won elections without using money. They had a clean sweep. War veterans, you remain a part of Zanu-PF." 1505: "When we started the new dispensation, we agreed to have important meetings in our country first with traditional chiefs, church leaders, captains of industry and the war veterans today. We got our independence from the war vets." 1503: President Mnangagwa acknowledges all senior party and Government officials, all delegates that have attended the meeting and guests from Tanzania’s CCM. "I heard what you said. Some issues are new, some are old. All are important,"
1500: President Mnangagwa is now on the podium and is now chanting the party slogans. 1453: Machacha invites VP Chiwenga to introduce President Mnangagwa. He chants the party slogan urging unity. "We will not add to what the war vets representatives have said. I am happy President Mnangagwa is now going to respond to the issues you raised," VP Chiwenga says he makes way for President Mnangagwa. 1451: A short interlude by the Police band. 1450: The 10 provinces have finished giving their reports. The meeting takes a breather. 1448: Mupaso, the last chairperson to make a presentation, leaves the podium and MC Machacha takes over. 1445: "There are issues of multiple farm ownership amongst our cadres but nothing has been said about it. We need to equally share the resources of the country," says Mupaso. 1438: Mupaso says Government should walk the talk on addressing issues raised by the war vets. The last report is from Midlands Chairperson - Virginia Mupaso - speaks on commissariat appointments. Requests that boards like anti-corruption produce results. Speaks on 99-year leases…requests that govt stops taking away land from war vets with land levy arrears…. She asks govt to deal with multiple farm ownerships, and there must be no sacred cows. Weighs in the primary elections saga, raps commissariat department on how it handled the polls, urges the department to plan in time such important programmes. She requests ED to come down to the provinces saying he is being fed with wrong information, different from what is actually happening on the ground. She says agric inputs are not being distributed fairly and properly in the provinces - war vets and party members are not moving together. 1436: Chairperson for Midlands Province Virginia Mupaso takes to the podium. 1403: Section Ncube, chairperson for Matabeleland South, is now making his presentation. He laments the rampant corruption at the Beitbridge border urging Government to deal the scourge as it is killing the country. Ncube urges all war vets to pray for VP Kembo Mohadi for a speedy recovery, as he paves way for his counterpart from Matabeleland North province. 1359: "President,we urge you to fight corruption because it is affecting us and the nation at large," says Kagwera as he ends his speech. 1354: Gift Kagwera from Manicaland Province makes his presentation. Kagwera says the vetting of war vets should be done honestly as there are some liberation fighters they fought with side by side but are now destitute. 1345: Murindi says while it might be tiresome to reverse and nullify elections, it is now incumbent upon party to send out people who are able to talk nicely to the masses in order to heal wounds. Murindi takes swipe at the previous administration that failed to address war vets welfare since 2016. "There is need to record the history of battles that were fought in Zimbabwe for posterity," Lastly, Murindi urges Government to recognise research in traditional herbs and knowledge systems in the fight against cancer, blood pressure and other ailments. 1342: Muwoni, as he leaves podium for Masvingo chairperson Ignatius Murindi, said the party should not only want to look at War Vets when we head for elections. 1330: Chairperson Muwoni, from Mashonaland West, says the just ended primary elections exposed some sinister activities in the commissariat department. He asks the President to look into the matter. 1321: Mashonaland Central chairperson Sam Parirenyatwa is now on the podium and says people surrounding the President are of questionable integrity with the G40 hand still showing. "In Mashonaland Central we have G40 members holding meetings. Some of the people who we think are with us are actually not. We need to restructure the party…our masses, our supporters did not vote in the primary elections and we are asking that those elections be repeated…Mashonaland Central saw defining battles of the Second Chimurenga as such we have departed fighters that never received proper burials. As a Government that comes from the revolution can you please assist in ensuring that our fellow comrades get decent burials,"
1314: "There are people trying to stop war vets from having strategic positions in the party. We are watching those who are against the spirit of the new dispensation as they are using dirty money, yet President Mnangagwa is saying we do not want corruption," says Sigauke. 1302: Daniel Sigauke from Mashonaland East takes over to make his presentation. Sigauke thanks President Mnangagwa for the successful launch of the 2018 Election Manifesto. 1254: Harare Province chairperson takes to the podium and says the war vets constituency accepts the resolution to have President Mnangagwa as the 2018 Presidential candidate. On welfare, he says the standard of living of war veterans has deteriorated, says the pension of $206 per month is below the poverty datum line, calls on govt to review the pension. Says war veterans have no land, those who had it, their farms were repossessed. war veterans seek exemption on import duty for vehicles. They also seek exemption on payment of toll-gates. They want appointments into key positions in govt. Lament lack of funding for projects. 1252: "It's sad that some war veterans lost during the primary elections because of some who used money to buy others and disenfranchising us. As we go for Presidential elections, you are our candidate. As said by Matemadanda, we need to mobilise support for everyone besides that primary election results were not a platform for happiness." He says there are some criminals who are surrounding the President and they need to be removed. Ncube implores President Mnangagwa to address cash shortages as there are many people accessing huge amounts of money while banks are dry much to the dismay of the general populace. Ncube has now finished his address. 1244: Ncube says war vets were the first to ask for reclamation of land in 2000 but unfortunately they are losing their land to some land barons who use financial power. 1236: War Vets Bulawayo Province chairperson Cephas Ncube makes first presentation. He says state of war veterans should be addressed asking President Mnangagwa to look at the pension which he says is little. He says some of the illnesses affecting war veterans are a result of situations they were exposed to during the war of liberation. 1235: "We should not only be waiting to get help from Government, but we need to do the best for ourselves too while relieving Government of other burdens. Government introduced Command Agriculture and war vets who benefited from agrarian reform should apply and benefit from programme. Those with A2 farms should apply for 99-year leases," As VP Chiwenga leaves podium, he declares the meeting open to plenary session as war vets representatives from the country's provinces make their presentations. 1234: Chiwenga said war vets appreciate the time set aside by President Mnangagwa to have this meeting. "War vets are a critical constituency in Zanu Pf and the country at large…Basa riya ratanga. Zimbabwe haichafe yakadzokera kuzvimbwasungata zvakare. Zimbabwe inyika inoerera ropa remagamba edu. This history cannot simply be erased as chalk on a writing board. Ministry is working with treasury to ensure that war vets issues are addressed on time, including issues of fees. All fees for last year and this year's first term were cleared. We are settling second term's arrears for this time in the shortest time,"
1230: VP Chiwenga says war veterans are owed school fees for their children amounting to US$10,5 million dating back to 2016 – the ministry engaging treasury to ensure these arrears are paid at the shortest possible time. Funeral bills amounting to US$1 million will be also be settled as soon as possible. 1226: VP Chiwenga says war veterans are a body politic critical to the survival of the ruling party and the nation at large. Thanks the war vets for coming to meeting the President at short notice. "Zimbabwe haimbofa yakadzokera kuzvimbwasungata zvakare". 1224: VP Chiwenga takes to the podium and acknowledges all delegates present. 1221: Matemadanda now introducing Vice President Retired General Constantino Chiwenga to give his remarks. 1208: Matemadanda implores all war veterans to go out and campaign for President Mnangagwa, the Zanu-PF presidential candidate for the 2018 harmonised elections. He ends his address. 1205: Matemadanda said "the voice of the war veterans is the voice of the revolution". Says they have been patiently waiting for leadership positions even a Councillor's position, for example. 1204: Blasts those who say war veterans are not disciplined, saying they are a highly disciplined lot. 1201: Matemadanda says he is happy that this meeting with President ED has come to fruition. Says this meeting is different from all the previous meetings…. "nhasi chinongove chisoja chete kubva kumusoro….," he says. 1212: Matemadanda says President Mnangagwa is ZANU-PF 2018 presidential candidate. He says the candidate is not losing sleep ahead of the elections because victory is certain. He says prophets of doom had cast spells over the meeting saying war vets are against the President. "Today's meeting is different from other meetings we did because 'nhasi chinongova chisoja chega chega kubva kwamuri kusvika kuzasi'. He says former Zipra and Zanla cadres are here as war vets. Anyone who says these war vets are undisciplined is an enemy of the revolution. Cde Matematanda adds while President Mnangagwa says the voice of the people is the voice of God, for today it is the voice of the war veterans is the voice of the revolution. 1158: ZNLWVA secretary-general Victor Matemadanda, who is also Sec for War Veterans in the Politburo is now on the podium. 1152: The Director of Ceremonies Machacha is now making the opening remarks and acknowledges all members present, from senior Government officials, service chiefs, and all guests from the country's ten provinces. 1149: Traditional leaders give a supplication thanking the ancestors for helping to deliver Zimbabwe. 1144: Chaplin General of the Zimbabwe Defense Forces gives a devotion and opening prayer. 1142: The police band now leads in the singing of the National Anthem. 1137: President Mnangagwa makes his entry into the venue much to the joy of the war veterans in attendance. 1132: VP Constantino Chiwenga, ZDF Commander Gen Phillip Valerio Sibanda, ZANU-PF's National Commissar Engelbert Rugeje have arrived, along with Minister of State for Harare Provincial Affairs Miriam Chikukwa have all taken their seats. 1117: Master of Ceremony Munyaradzi Machacha introduces a delegation from Tanzania's ruling Chama Cha Mapinduza party that is also attending the event. 1111: Revolutionary choirs and poets give pieces of work reminiscing of the liberation experiences much to the cheer of the crowd. 1053: Currently, Principal of the Chitepo School of Ideology Munyaradzi Machacha is paying homage to the heroes and heroines of the liberation struggle, both the living and the departed. 1039: ZNLWVA Chairperson who is also Special Adviser to President Mnangagwa, Chris Mutsvangwa, has also arrived. In a strong show of solidarity with the new dispensation some of the patrons are raising placards with messages: "Trustworthy Leader" "The Voice of the People is the Voice of God" "Mutungamiri ane hany'a nevarwi verusununguko". Representatives from Bulawayo province have just arrived and are taking their seats. 1013: Ministers Obert Mpofu, Paul Mavhima, Petronella Kagonye, David Parirenyatwa and Simbarashe Mumbengegwi are among Government officials that have graced the event. War cadres are still thronging the venue which so far is nearly full to the brim. This is the first interface between President Mnangagwa and the War Veterans in the new dispensation and the post-Mugabe era. Zimbabwe National Liberation War Veterans Association secretary-general Victor Matemadanda has arrived. 1002: The Police band is entertaining delegates with revolutionary songs. 1000: The City Sports Centre is lively today as Zimbabwe's liberation war heroes and heroines have an interface with President Mnangagwa. War veterans' representatives from the country's ten provinces are ready to meet their patron. The interface is running under the theme: "War Veterans – Advancing the Success of the New Dispensation."